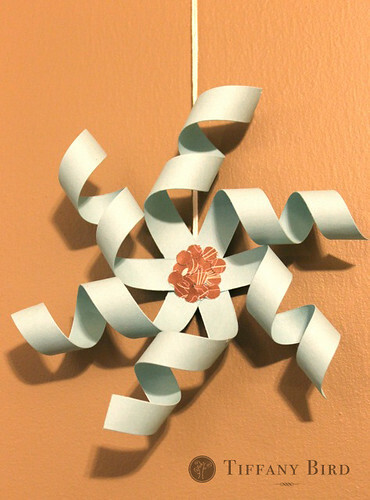 Last of the 3 part snowflake tutorial series. 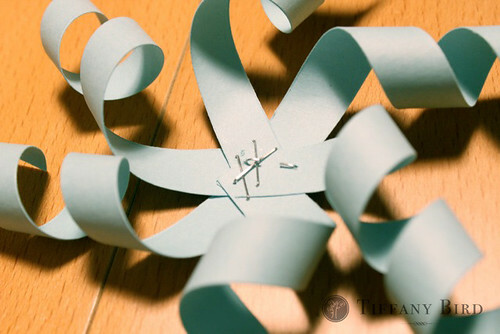 Hope you have been having fun making the other two snowflakes, cookie cutter paper snowflake and piping paper snowflake. 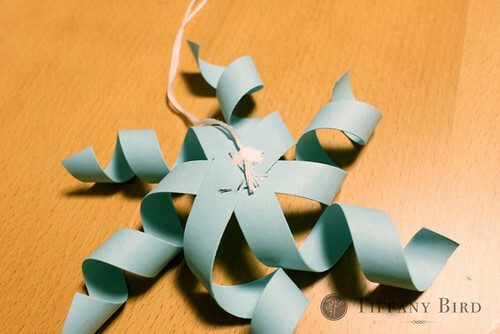 Then a surprise forth snowflake, the twisted paper snowflake. If you make something using this tutorial, please upload pictures of it in our Flickr group to show it off to everyone. You may be featured on Simply Modern Mom. 1. 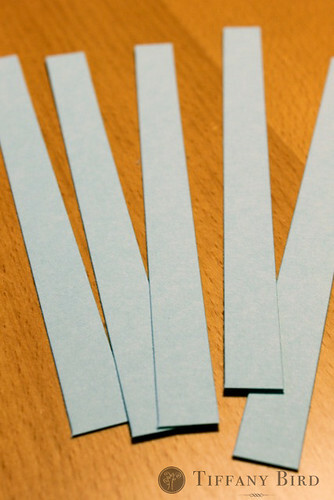 Cut your paper into 1/2″ x 6″ strips. Cut 6 strips. 2. Tape one end of the strip diagonally to a pen, pencil or marker. Twist the rest of the strip around the marker, then tape the second end. Do to all 6 strips. Let it sit for about an hour or so. 3. 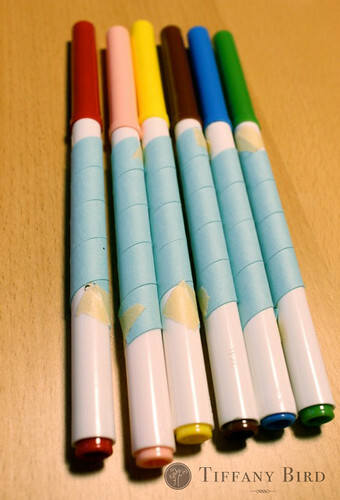 Unravel the paper from the marker. 4. 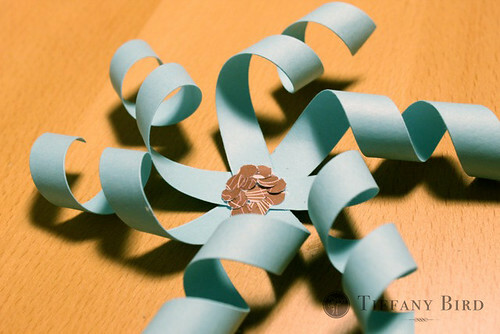 Take two of the curled paper and join them together in the center, they are across from each other. 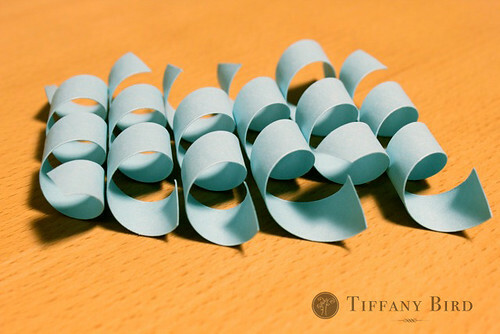 Then take two more curled paper and space it evenly between the previous two strips. 5. Staple that first portion in the center. 6. 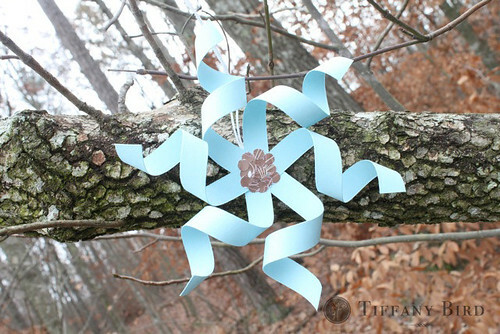 Take the last two strips and space it evenly on the open part of the snowflake. Staple it again. You may want to staple a few more times to keep the strips secured. 7. 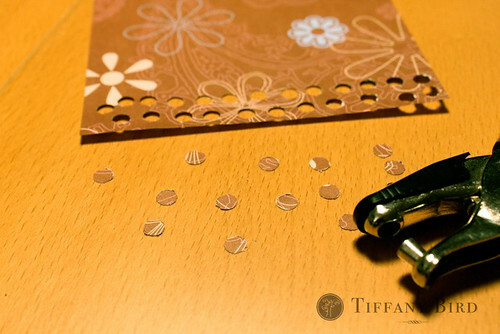 Hole punch a different colored paper and glue the punched circles to the center, covering the staples. Or add other types of embellishments. 8. 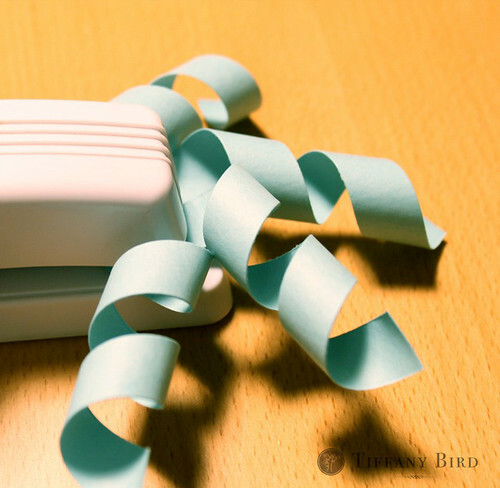 String it with ribbon or strings using glue or tape on the back. How about a photo tutorial, cause your photos are to die for!! Beautiful pics and a great tutorial. I love your snowflakes! Wow paper never looked so good! Simple and fabulous. Those are awesome–and very unique! Oh my goodness girl these are good ! You must come on over and share these today and link up at my Ornament Party. Seriously… folks need to see these – they’re marvelous ! beautiful! great tut, too. tfs! Love this. So cute, and definitely getting bookmarked! These are really quite beautiful. So simple–but simply gorgeous. A wonderful effect. And your photographs are just stunning. Really stunning. Fun and easy- I love it!! Don’t you just love creating your own ornaments. So fun & cute. These are great! Love them, will be making some. Thanks. These are so cute. Nice tutorial. Super cute! 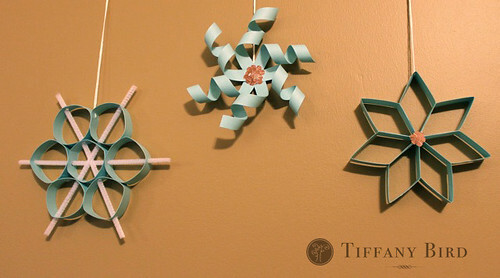 Putting this on my list of crafts to make with the kiddos on Christmas break! Oh thank you for posting these very clear instructions. These are so simple to make for such lovely ornemants. Thank you for sharing and have a GRAND weekend. These snowflakes are so fun. Can’t wait to make them. Those are just so pretty – will have to make these with the girls next month.